This Sunday, December 5 you’ll find me at the In Point Fair and Expo at Garden Jewels in Point Fortin, Trinidad. You can purchase novel photo items, cards, prints and calendars or get your portrait done at a special event price. If you’re in Trinidad we would love to see you or meet you for the first time. The expo is a ticketed event but costs a mere $30 entry fee. It’s well worth it considering the offers and the chance to win lovely door prizes, among which there will be a print from me. 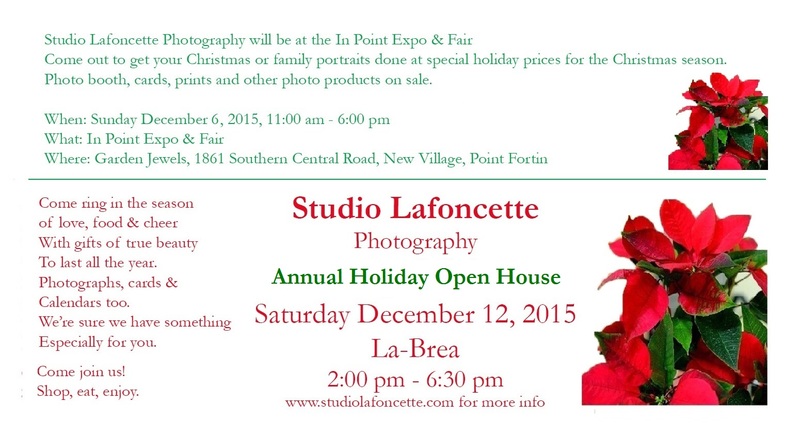 Saturday December 12 is our 3rd annual open house. Again you can purchase photo items, take your picture and spend some time. There will be light refreshments. Come out and celebrate the seasonal festivities and all the good we’ve had and hope for in the new year. I wish I was celebrating Xmas in TNT. Come home if you can, and if you can’t get a piece of home every month with a calendar from Studio Lafoncette. Shop at http://www.studiolafoncette.bigcartel.com. Our inventory is more than 60% gone so act fast and get discounts when you buy more than one calendar.